The trip down the Dismal Swamp Canal is always one of our favorite parts of the trip. Its wooded and intimate and quiet and we see few other boats. Not as many fall colors as in past years. I don't know why...its getting down to 30 degrees tonite! The Dismal Swamp is narrow and shallow. This 48' Krogen barely seems to fit. The North Carollina Visitors' Center has about 150' of free dock. No surprise that its a popular stop. 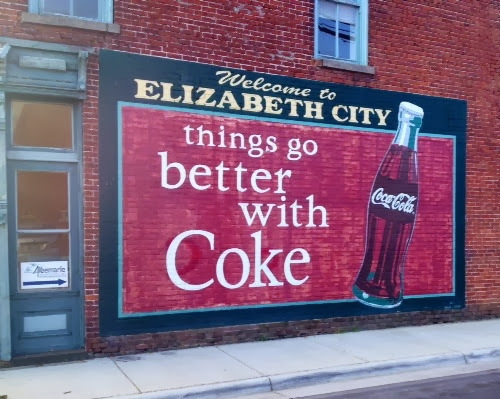 We decided to go on to Elizabeth City for a couple of nights. We are taking a day off because there are Small Craft Warnings on the Albemarle Sound, not a body of water to be trifled with. Good opportunity to change the oil, have lunch out and visit the museum.